Together the UI IPRC and our research partners are using innovative tools and technologies to study injury. From video/GPS systems developed in collaboration with partners at the UI College of Engineering to world-renowned simulators, these technologies offer new and naturalistic ways to learn about the risk factors and mechanisms of injury. Although bicyclists are at higher risk for injury in a crash compared with vehicle occupants, very little is known about risk factors for bicycle injuries. Pedal PORTAL is a data acquisition and coding system used to naturalistically study adult and child bicycling behavior and risk exposure. 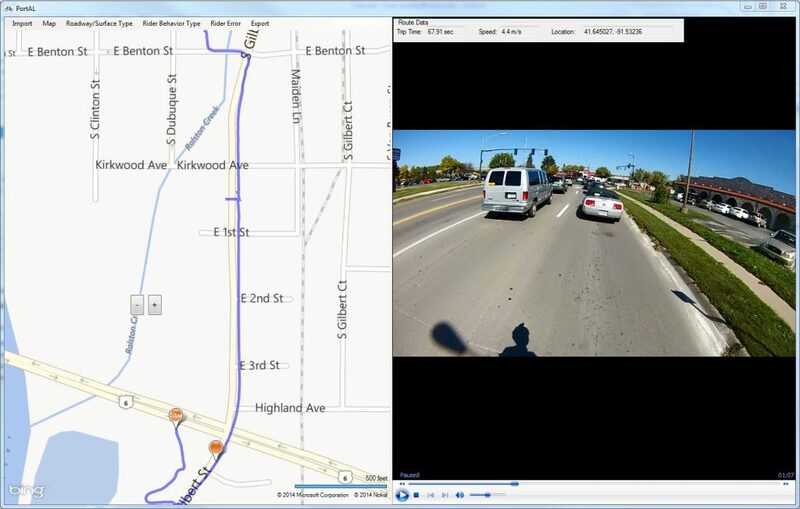 The first version of Pedal PORTAL utilized GPS-enabled helmet cameras and a specially designed graphical user interface to examine adult and child bicycle crashes, near crashes, traffic violations, errors, and general route preferences. The system is currently being upgraded with additional cameras to be mounted on the bicycle and a button for bicyclists to depress to indicate any safety-relevant events in real-time. See some research using Pedal PORTAL. In order to better understand risk factors for rural roadway crashes– especially those involving farm equipment– we have developed a video system to record vehicle interactions with farm equipment. Safer Trek is a rear-facing video/GPS data acquisition system designed to capture the frequency and types of driving behaviors of rear-approaching vehicles. This technology is being used on the back of farming equipment to identify and quantify risk behaviors associated with drivers of rear-approaching vehicles and how they interact with farm vehicles when they are on roadways. Many types of vehicle improvements, driver behaviors, and driving situations can’t be tested in real roadway situations, due to ethical and safety concerns. 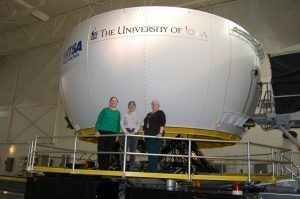 The National Advanced Driving Simulator (NADS) is a transportation safety research center at UI’s Research Park. NADS uses world-class driving simulators and instrumented vehicles to conduct research on topics such as teen driving, impaired (drowsy, drugged) driving, and vehicle interactions with bicyclists and pedestrians, among others. 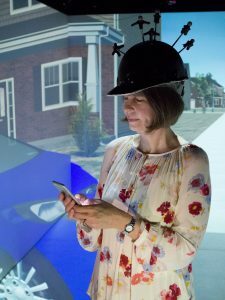 The Hank Virtual Environments Lab uses virtual environment technology to study human behavior, like how pedestrians and cyclists cross traffic-filled virtual roadways, impacts of child development on traffic safety behaviors and decision making, and how people perceive and adapt to virtual environments. Cyberbullying is one of the most prevalent and fastest-growing types of school bullying, and one of the most difficult for school personnel to address. In order to better understand the dynamics of cyberbullying, UI IPRC’s partners from the UI Department of Computer Science developed a cyberbullying app that will help researchers understand the contents and social contexts of cyberbullying. The app monitors electronic communications of middle school youth (text messages and social network posts) for cyberbullying content. See some research using the cyberbullying app. Motor vehicle crashes are the leading cause of death for teenagers in the U.S. Parents often have little or no idea how well their teen is driving, especially when the teen is driving without their supervision. To study teen driving, UI IPRC researchers use an in-vehicle video feedback system, augmented with GPS, which tracks the driving amount and routes. 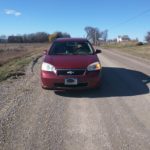 When there is is an abrupt change in speed or steering direction, cameras capture the moments inside the car and on the roadway before and after this event. This technology allows researchers to identify driving errors and safety behaviors (like cell phone and seat belt use) as teens drive. These event-triggered videos are then analyzed and shared with parents of the teen drivers and used to help develop parent-teen communication strategies on driving. See some research using in-vehicle video feedback.